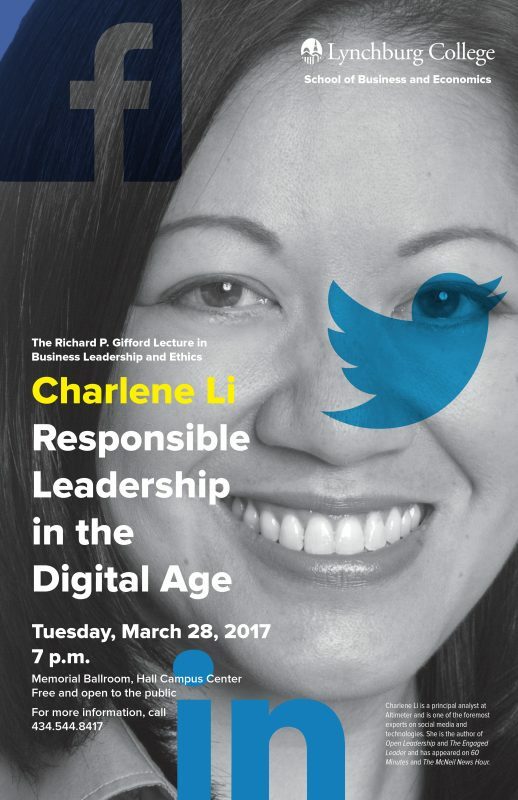 Critically acclaimed author and speaker Charlene Li will present “Responsible Leadership in the Digital Age” for the Richard P. Gifford Lecture in Business Leadership and Ethics on Tuesday, March 28, 2017 at 7 p.m. in the Hall Campus Center Memorial Ballroom. Charlene Li is a principal analyst at Altimeter, a Prophet company. As one of the foremost experts on social media and technologies, Li’s deep knowledge of leadership, strategy, interactive media, and marketing makes her an indispensable ally in today’s rapidly evolving marketplace. Previously, she was the founder and CEO of Altimeter Group prior to its joining Prophet. A Harvard Business School graduate, Li is an expert on social media and digital technology. She has authored New York Times bestseller Open Leadership and coauthored Groundswell, which was named one of the best business books in 2008. Her most recent book, The Engaged Leader, is a call to business leaders to adapt to the digital landscape, and revolutionize their relationships by connecting directly with their followers. Li is a highly sought-after public speaker who has reached audiences as the keynote at conferences such as the World Business Forum, World Economic Forum, American Society of Association Executives, South by Southwest and Web 2.0.